A unique and beautiful blend of the quality roasted coffee beans and chicory. 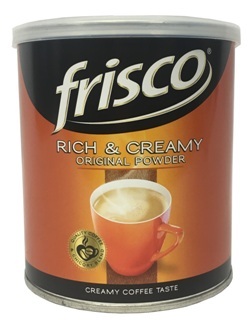 Frisco is an instant coffee that is rich in flavour, mild in strength and amazingly creamy. Frisco ‘tastes like home’ and evokes all those nostalgic happy memories. Maybe this is why it has become one of South Africa’s most loved instant coffee brands. Glucose, quality roasted coffee beans and chicory.